Two years ago, Federal introduced its Syntech ammunition. I wrote a review of it in our June/July 2016 issue, and I was impressed by what it had to offer: a polymer-coated bullet that delivers less fouling, less friction (and therefore less barrel-killing heat) and less splash-back when firing at steel targets. And with its Total Synthetic Jacket and lead-free Catalyst primer, the ammunition meets lead-free restrictions in force at some ranges. I was impressed, but after the much-ballyhooed introduction, nothing happened. To be honest, I thought the trail had gone cold, that shooters hadn’t responded to this innovative new ammo. Not so. The lack of attention was due to market factors: Federal was so busy churning out standard ammo to meet demand that the Syntech project was basically shunted aside as the Anoka, Minnesota, manufacturing plant—the largest ammo-making facility on the globe—focused on catching up with other orders. But in the meantime, one of the company’s project managers, Justin Johnson, was competing in local U.S. Practical Shooting Association matches in Minnesota and realized nobody was shooting factory ammo. The light bulb went off in his head: What if we were to offer something of value to people who wanted to compete but didn’t want to reload? The Action Pistol version of Syntech (r.) compared to the standard load. The Action Pistol’s flat nose hits steel harder and tears better holes in cardboard targets. Enter Syntech Action Pistol. Right from the factory it meets USPSA Power Factor. If you’re not familiar with Power Factor, it’s a formula—bullet weight in grains times velocity in feet per second, divided by 1,000—that determines whether your scoring in a USPSA match will be Major (165 PF) or Minor (125 PF) and what division you can compete in. For instance, all competitors entering Production division—basically stock, off-the-shelf guns—shoot Minor, and almost all 9mms fall into the Minor category as well. Without diving too deeply into this, Power Factor is set up so shooters can’t “cheat” by using low-power ammo, which would give them an advantage because they can make hits faster due to lower recoil and less muzzle rise. At the opposite end of the spectrum, you don’t want to exceed a given Power Factor by more than is necessary, and most standard ammo is a lot snappier than you want or need. That’s why most active shooters reload, building ammo that comfortably makes Power Factor (you want a fudge factor to account for temperature differences and chronograph variations) but no more. 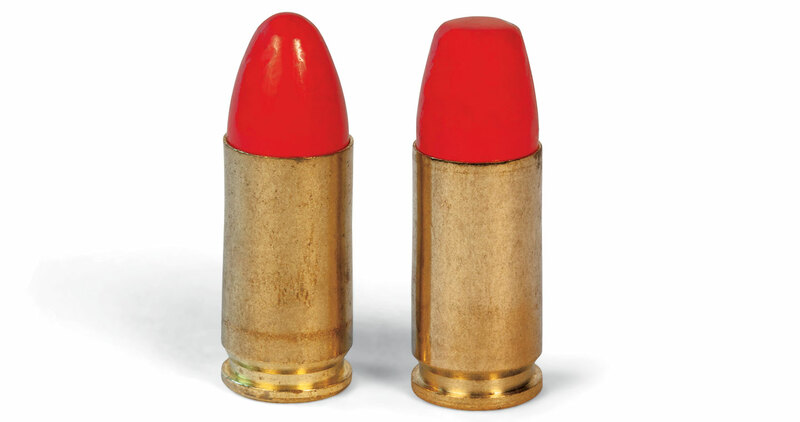 Federal estimates only about 20 percent of action shooters use factory ammo, and this is where the company saw an opportunity to create a round that would meet the USPSA’s Power Factors but not require shooters to reload. And with its sanction as the official ammunition of USPSA, shooters can bypass the chronograph test required at most matches because their ammo is guaranteed to make Power Factor. If you look at this ammo you’ll see the grain weights are not traditional. For example, the 9mm weighs 150 grains. This is not some arbitrary weight. It is the end result of a lot of experimentation to find a soft-shooting load that makes Power Factor. This weight might seem counterintuitive. A heavy bullet recoils more than a light bullet, right? Yes and no. If a heavy bullet is loaded to full SAAMI specs, yes. But because Power Factor is based on both bullet weight and velocity, a heavy bullet at slow speeds makes Power Factor and will be softer shooting than a lighter bullet that must be pushed much faster to make the threshold. You’ll also notice the Action Pistol version of the Syntech bullet has a different meplat. It’s flat instead of rounded like you’d find on a typical full metal jacket. The flat nose accomplishes two things. One, it delivers more energy on steel targets, knocking them down faster and also making it more likely an edge hit will do the trick. It also tears larger, cleaner holes in cardboard targets. This is important because if a bullet hole touches the perforation of a higher scoring ring, the shooter gets credit for the higher-value hit. Notes: Walther PPQ has a four-inch barrel; Springfield XD Tactical has a five-inch barrel. Accuracy results are averages of four five-shot groups at 25 yards from an MTM pistol rest. Velocities are averages of 20 shots recorded on a Pro Chrono chronograph placed 10 feet from the muzzle. Elevation, 4,900 feet. Temperature, 63 degrees. I’ve burned through close to 1,000 rounds of Syntech Action Pistol—one practice day and USPSA match with a borrowed Glock 17 and a Steel Challenge match with my Springfield XD Tactical, plus the accompanying chronograph test through the XD and my Walther PPQ. The latter was used because Federal based its load calculations on a four-inch barrel, likely the shortest you’d find at a USPSA match. It’s hard for me to draw any conclusions from the Glock experience because I don’t shoot a Glock, but the ammo ran flawlessly. However, I can definitely vouch for how soft-shooting the round is out of my XD. Steel Challenge doesn’t have a Power Factor to contend with, but it’s all about speed, and reducing muzzle rise is key. Since I shot Production, where compensators and other recoil-reducing modifications are not permitted, soft-shooting ammo is definitely the way to go. And when Federal says Syntech reduces fouling—thanks to clean-burning powder and the cutting-edge Catalyst primer—it’s not kidding. After the Steel Challenge match, I stripped down my Springfield, and it hardly looked like it had been fired at all, much less have a couple hundred rounds put through it. That’s not only convenient post-match, but less fouling also means less chance your pistol will choke during a match. Competitions like USPSA are great for building skills and are a lot of fun besides. But it can be intimidating for newbies. With Syntech Action Pistol, Federal has eliminated one of the barriers to entry because ammo is now one less thing you have to worry about. 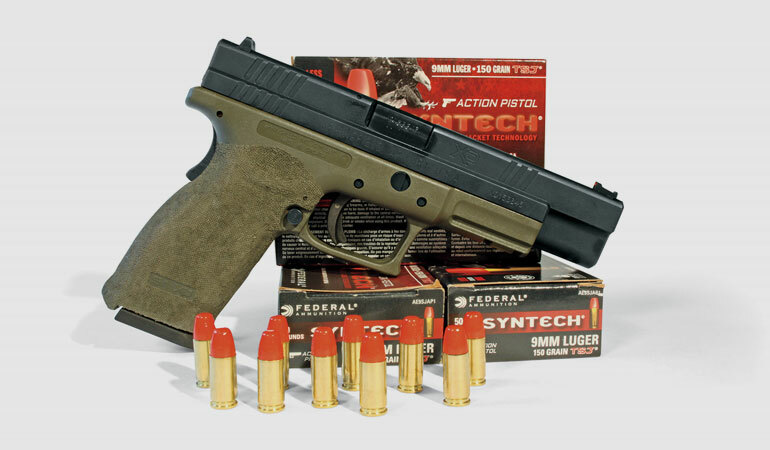 Syntech Action Pistol is available in the 9mm load described here as well as .40 S&W (205 grains) and .45 ACP (220 grains).